– Ensemble, with Kasey Mahaffy (Attorney General) and Emily Goss (Lucie Manette) in foreground. Photo by Craig Schwartz. Kasey Mahaffy (Gabelle) and Tavis Doucette (Charles Darnay). Frederick Stuart (Sydney Carton). Photo by Craig Schwartz. Nineteenth century English novelist Charles Dickens, is one of the English-speaking world’s greatest writers. His many novels validate his talent for creating memorable characters along with a gift for rich plotlines and the ability to keep the reader fully engaged from beginning to end. In 2016, Poulton debuted his version of Dickens’ classic story of love and redemption set against the tumultuous backdrop and events leading up to the French Revolution and the infamous ‘Reign of Terror’ at the Royale and Derngate theatre complex in Northampton, England. The success of the Northampton production must have caught the eyes and ears of Founding Producing Artistic Directors Julia Rodriguez-Elliott and Geoff Elliott. The Elliott’s (husband and wife) have successfully navigated the challenging and daunting waters of presenting quality theatre in the traditional ‘rotating repertory format’ thanks to a dedicated and committed resident artists program that has become the backbone of the organization over the last twenty-six years. “A Tale of Two Cities”, crisply directed by the Elliotts’, is one of Dickens’ sweeping stories that is not staged very often. The core story is often mistakenly confused by audiences, as the musical “Les Miserables”, due to the similar rebellion sequences. 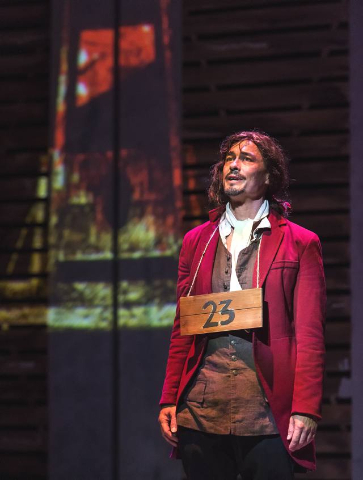 ‘Two Cities’ deals with the 1789 French Revolution in Paris, while ‘Les Miz’ takes place in the south of France in the city of Digne, in 1815 and is known as the ‘Student Rebellion’. In short, “A Tale of Two Cities”, tells the story of French doctor Manette (Nicholas Hormann) and his daughter Lucie (Emily Goss), and Emily’s French-born husband Charles Darnay (Tavis Doucette), a former French Aristocrat who renounced his title and moved to England and is married to Lucie. 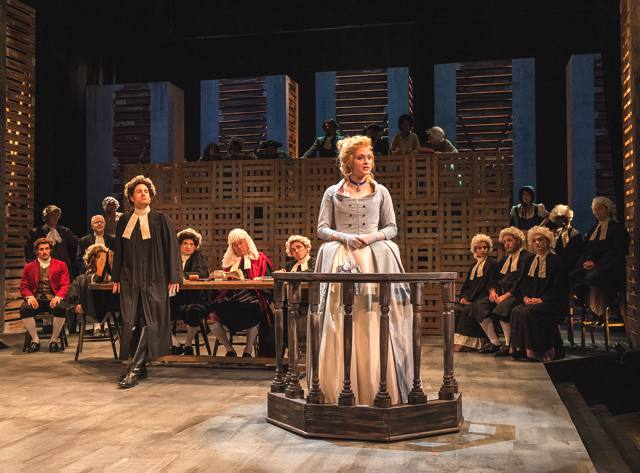 Darnay’s friend and lawyer Sydney Carton (Frederick Stuart), as it happens, harbor’s a secret unrequited love for Lucie, and is determined to help her and his friend Darnay in any way he can. In France the revolution and its supporters cast a wide net in an effort to punish the hated aristocrats. When Darnay receives word in London that a friend is in trouble with the rebels and their revolutionary court and trials, he returns to Paris to help and is arrested and put on trial as a traitor. The main accuser against him Madame Defarge (Abby Craden) is determined that Darnay must die, because his family killed members of her family. She wants an eye for an eye. These are the main characters that propel the narrative forward. It may appear as a somewhat dated dramatic piece, but the core values of two hundred years ago can still resonate with 21st century audiences, especially when it comes to understanding today’s toxic politics. There are twenty-three performers, some of whom play multiple roles in this fine ensemble production. Unfortunately, there is not enough space to list everyone. However, there are always standouts. Emily Goss renders a small but integral role with passion and empathy as Lucie. Goss goes from a wonderful, enchanting, Muriel in ANW’s recent production “Ah Wilderness! to a frightened, sympathetic Lucie in ‘Two Cities’. Abby Creden as the villainous Madame Defarge, spits out her bilious feelings and talk of revenge in whiplashing dialogue. She controls whose head is to leave their shoulders, and who is to be spared. That’s too much power to be left to a single avenging person. Tavis Doucette as Darnay plays to the stoic and steadfast traits that make him a sympathetic character and a loyal friend of Sydney Carton. Frederick Stuart, as Carton is the real hero of this tale of two cities, giving his last full measure of devotion to Lucie and Darnay. Stuart delivers a finely judged performance as Sydney Carton. Solid support comes from Nicholas Hormann, Trisha Miller, Jeremy Rabb, and Geoff Elliott. 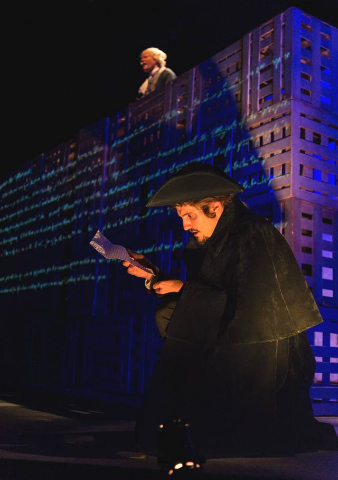 The production is well paced and neatly choreographed for such as large company. But I am puzzled by the directors’ decisions to have the French characters speak with English cockney accents. It’s natural for the cockney-accented roles for English speaking characters, but it’s a bit confusing to have people from two different countries sound alike when delivering dialogue, n’est-ce pas? 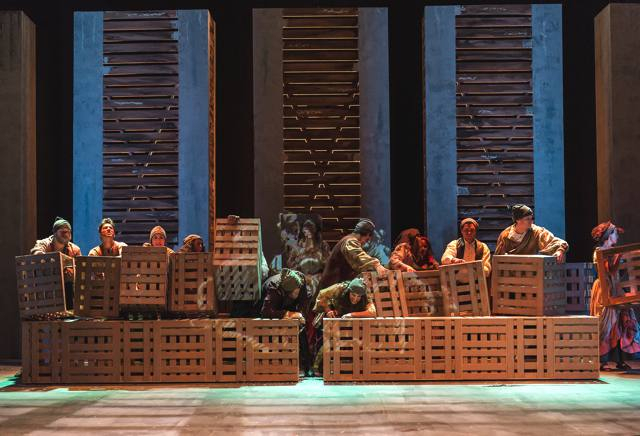 In the technical department, the creative team led by the Elliotts have a functional set and performing area designed by Fred Kinney, with lighting design by Ken Booth, and original Music Composition/Sound Design by Robert Oriol. The costumes Designed by Jenny Foldenauer are spot-on and appropriate for the period for both the aristocrats and the rebelling mobs and peasants. 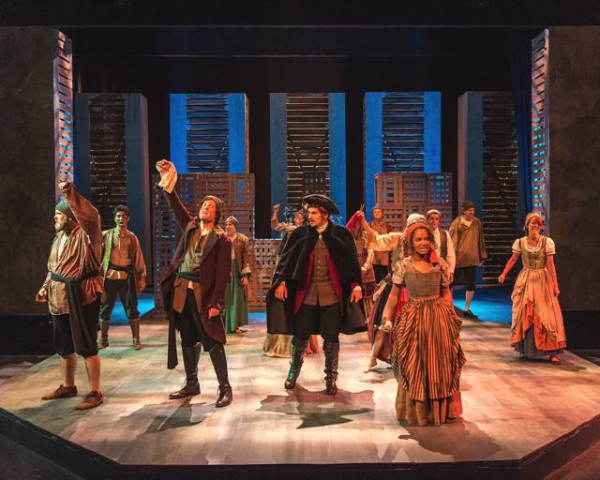 “A Tale of Two Cities” is a splendid production that runs in repertory through November 19th. The other two productions also running in repertory are: “The Mad Woman of Chaillot” through November 11th, and G.B. Shaw’s “Mrs. Warren's Profession”, through November 18th. Courtesy of Jack Lyons and Desert Local News.